As I was driving through town yesterday, I noticed a man preaching at the thousands of cars that passed him. Actually, I think he is preaching to the drivers but since it is summertime in the South everyone has their windows up and are enjoying their air conditioning. Maybe that is why the street preacher is screaming his message – to get through the glass? He has got to be hot. I wonder what church he goes to? Is he homeless and bored or independently wealthy and called to preach? Is he expecting a response from us? If so, what kind? Do we honk to agree or disagree? When he gives the altar call, do our cars “come forward” in response or do we leave our vehicles to follow him? How long does he stay at that corner? What’s his story? Was he doing this at recess in grade school or is this a relative new gig for him? Is he a whack-job? I mean – he is preaching down the street from the mental assylum. 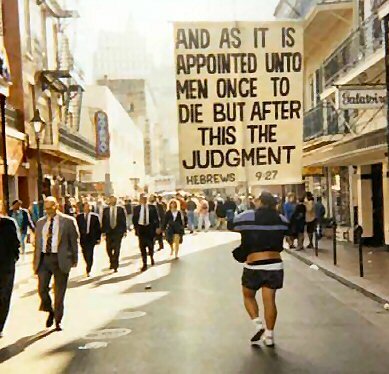 Why is there not a reality TV show about street preachers? God knows we have a reality show about everything else! Why do street preachers intrigue me? Why aren’t street preachers ever shouting about the importance of tithing or keeping the Sabbath or fasting? Why is it always about wrath? Does God really call people to do this… on the street…in the South… in the summertime? Does he eat locusts like John the Baptist? All these thoughts run through my head in 90 seconds, while I am trying to listen to what he is saying. He has either lost his mind or he has the mind of Christ. Maybe he is my brother in Christ? I mean – he does have a Bible and he reads it more than most Christians I know – even if he is shouting to passerbys who aren’t listening. I do know he makes me uncomfortable – kind of like the homeless man. You are drawn to look and yet you do not want to be caught looking. He caught me looking today. So, I waved. I didn’t know what to do so I waved. Now that I mention it, that seems like an awkward response. He must of thought so too with the look that he gave me. I don’t think many people wave at him with all their fingers in the upright position. He made me think about the prophet Jonah who was a street preacher sent to the town of Ninevah. God told him to preach a sermon of hellfire and brimstone to everyone he could. I wonder what Ninevah thought of Jonah. Fresh out of the belly of a whale, I’m sure he looked a lot like the homeless-looking street preachers we often see in our cities. I wonder if some Ninevite man in a chariot ever waved at him? If they ignored Jonah’s message, Ninevah would have been destroyed in 40 days. God takes His warnings very seriously. Fortunately for Ninevah, the people took heed of Jonah’s message and the entire city repented, all 120,000 of them. To this day, it is still the largest recorded revival ever to occur. I think I will say a prayer for him and for all the “crazy” street preachers I come in contact with. I wonder what crazy thing God will tell me to do today. I wonder if I will have the guts and faith to actually do it? Moral of the story: Pray for the street preachers and roll down your windows. You might hear something that will challenge you… or worse yet – change you. If nothing else, you just prayed for a guy who could use a prayer.